Oak, semi reclining arm chair. Excellent condition. Sprung cushions. Oak, semi reclining arm chair. Excellent condition. New sprung cushions. See photos. The fabric is in lovely cream/beige and duck egg blues. When I bought it many years ago I was told it was thought to have once graced a Cambridge College room. This is a gorgeous antique bergere armchair dating from the late Victorian period. It is made from solid oak with lovely turned front columns with trellis detail to the front edges and cane work sides. Pair of oak ladder back chairs with traditional graduated rungs and turned supports to the back. Rush seats. SEAT HEIGHT 47cm. If you would prefer to collect yourself that is fine by us. FLOOR TO ARMS 66cm. Throne Chair. Upholstered Back Panel & Sprung Seat. Elegany Scroll Arms & Block Legs, Joined By A Middle Stretcher. A Fantastic Late 19th Century. To Sit In The Chair Is Comfortable & Supportive. The Upholstery Is Not Original, But Tastefully Done & In Good Condition. 4 x Sandringham Armchairs. 0riginally purchased from Rutherfords in Morpeth in 1988 £876 OFFERS AUTO ACCEPTED: For a quick sale Offers of the starting bid upwards are set to be auto accepted. Offers below will be concidered but remember that option is removed by eBay once a bid is made. Collection only in person from MK2. Early 1800's Oak Elbow Chair. 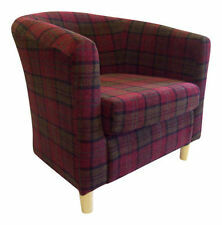 This lovely chair has an upholstered drop in seat. The chair is in good solid condition considering it's age. There are marks and historic repairs but the chair remains sturdy. Seat width 50cm. Seat depth 43cm. Oak veneer runners Durable fabric upholstery Strong metal lattice detail Rocking chair The yellow fabric seat rocks back and forth on a pair of oak veneer runners. In between seat and runners, black metal girders produce a simple lattice that provides added support while enhancing the aesthetic. 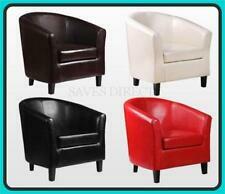 From its round seating area, the chair spreads outwards to the armrests, before narrowing into the backrest. A plump headrest provides added comfort. .
And is a chippendale design. Early 1800's Mahogany Elbow Chair. 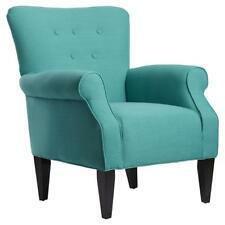 This lovely chair has an upholstered drop in seat. The chair is in good solid condition considering it's age. There are marks and historic repairs but the chair remains sturdy. Both chairs have been deep cleaned hand condition waxed and hand polished from top to bottom. Depth:- 53cm. There are around 50-100 high definition super-sized pictures at the bottom of this page. Oak veneer runners Durable fabric upholstery Strong metal lattice detail Rocking chair The blue fabric seat rocks back and forth on a pair of oak veneer runners. In between seat and runners, black metal girders produce a simple lattice that provides added support while enhancing the aesthetic. From its round seating area, the chair spreads outwards to the armrests, before narrowing into the backrest. A plump headrest provides added comfort. .
Used but with a throw on. Excellent condition. Collection from calverton nottingham. Soft faux leather upholstery Oak veneer runners Metal lattice detail Scandi design The chair is upholstered in soft, smooth faux leather. Its wide seating area and broad lower back are designed to produce maximum comfort. Shallow armrests enable the backrest to taper towards a rounded summit. A pair of oak veneer runners allow for a gentle rocking motion to be achieved, while black metal girders support the seat via a latticed formation. .
Footstool: Height 36cm x Depth50cm x Width 38cm. 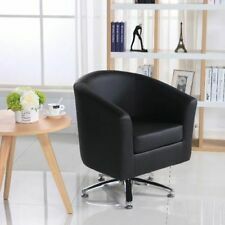 Armchair: Height 75cm x Depth 70cm x Width 67cm. 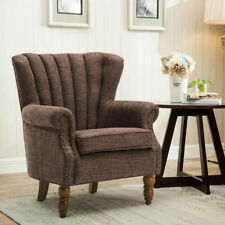 Characterized by linen fabric design with a backrest and arms with a foam padded seat pad with four sturdy wooden feet. 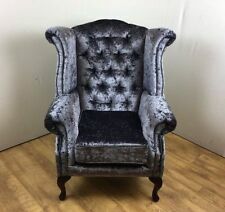 Retro Upholstered Armchair. It's hard to beat a classic which is why we've designed this fantastic chair with a chic, retro look. Upholstered in grey fabric to be easily matched with any decor and finished with solid wooden legs, all it takes is 1 or more to complete the stylish look of your kitchen or dining area, it's even perfect for a stylish office solution.